Hoping to build a buffer between the Comanche and the settled areas of Mexico, the Mexican government allowed Americans to emigrate to remote and empty Texas. The native population was soon outnumbered by the immigrants, many of whom were from the southern states, so they wanted to continue their practice of slavery even though it was illegal in Mexico. More important, this was the Age of Expansion and Americans were used to settling and absorbing an area, regardless of what the original population thought, so conflict was inevitable. After a series of confrontations, open warfare began in October 1835 and the rebels had gained control of Texas by early December. Believing that the Mexican government would not be able to respond until spring, attention shifted from building an army to debating whether or not to declare independence. However, Santa Anna gathered an army much faster than expected and appeared in front of the Alamo in early February. 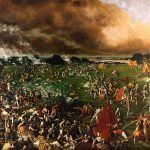 In the 1830s, American emigrants settled in the Mexican province of Texas, but Santa Anna’s increasingly despotic rule is driving people to the brink of revolt. 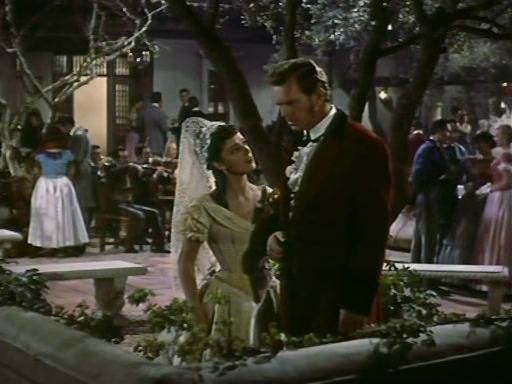 When the conspirators try to recruit Jim Bowie (Sterling Hayden), a wealthy landowner who is married to a Mexican, he argues against revolt. Unknown to the conspirators, Bowie is an old friend of Santa Anna (J. Carroll Naish). Despite their friendship, Bowie warns Anna that he is becoming a despot and the American colonists will not accept such treatment. 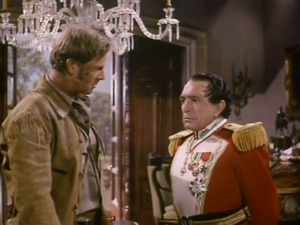 When fighting finally breaks out, Bowie initially remains on the sidelines until he recruits volunteers, and meets with Sam Houston, who makes him a colonel. 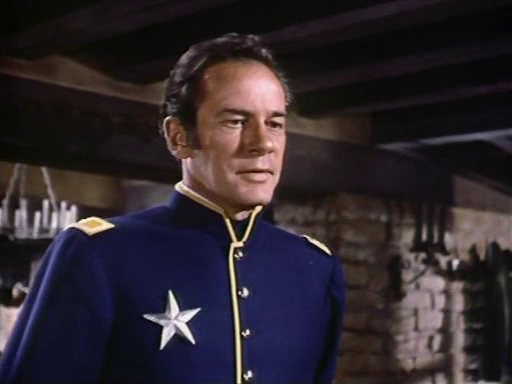 Sent to decide whether to blow up the Alamo or defend it, Bowie clashes over command with William Barret Travis (Richard Carlson). Bowie decides to defend the Alamo, just before Davy Crockett (Arthur Hunnicutt) arrives with thirty men. However, Santa Anna suddenly appears with an army. A night-time attack destroys the Mexican siege guns, but Bowie is badly hurt. Worse, they learn that Houston can not relieve them because he does not have an army, so they must face the final Mexican assault alone. Jim Bowie, the former slave-runner and land fraud expert, has been transformed into a hero. While it is true that Bowie had married a Mexican, the real man seems to have been motivated by an attraction to her father’s land, not love. Bowie had not even included his wife in his will, although to be fair, he did not actually own anything, except for debts and forged land grants, which is what had driven him to move to Mexico. 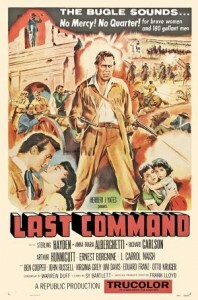 Although the screen version initially argues against revolt, the real man had been one of the War Dogs agitating for secession. However, Bowie was a respected fighter, who had led troops in the early skirmishes of the Revolution. In the movie, Bowie is badly hurt during a night-time raid on the siege guns. In reality, a drinking bout that lasted several days had overwhelmed his immune system, and he had been laid low by a disease just when Santa Anna’s army appeared, leaving Travis to assume command. Presumably, the screenwriter changed the situation since collapsing with a viral infection brought on by non-stop partying was not very heroic. Early in the film, one of the conspirators does not trust Bowie because he is a Mexican citizen, which is a strange complaint, since all of the emigrants were Mexican citizens, aside from the wetbacks who had entered Texas illegally. Colonists had to swear allegiance to Mexico in order to receive land grants. 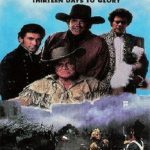 Probably the greatest fiction in the movie is the friendship between Jim Bowie and Santa Anna. I wonder if the friendship was invented as an excuse to have the two men play a scene together, showing that Anna is buffoonish compared to Bowie, and much shorter. Admittedly, despot is a perfect description of Santa Anna, and rebellion was simmering across Mexico, even after he ruthlessly crushed a revolt in Zacatetas. However, trouble had been brewing in Texas years before he seized power. All of the problems are blamed on Santa Anna, but he did not decide to send more garrisons to control Texas, that had been done by the previous government as part of the April 6 law. The movie’s overall chronology of the revolt is correct. Mostly. Worried that unrestrained American immigration would result in the transformation of the state into an American colony, the Mexican government passed a bill on April 6, 1830 that authorized the construction of military posts in Texas and one of the main duties of the smugglers would be the collection of customs duties. The War Dogs needed an issue to rally support and they found it when Mexico passed the April 6 Law, stirring up hatred of Colonel Juan Davis Bradburn, a Kentucky-born ex-filibuster, who was the local commander of the Mexican troops at Anahuac, a key smuggling center. Bradburn actually enforced the prohibition on slavery and refused to return runaway slaves who reached his jurisdiction, which led to frequent clashes with Travis and his partner Patrick Jack when they represented owners who wanted their property back. Speaking of slaves, where are they?? Travis’ slave Joe, or any black person for that matter, does not appear. Apparently, the movie was made when white audiences did not want black people in their films. However, it is fitting that Joe is absent, since the script skips over the inconvenient fact that one of the main conflicts was over slavery. 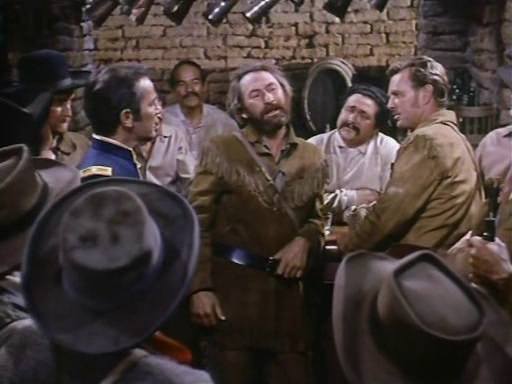 Early in the film, Travis is arrested by Redburn (presumably based on Bradburn) for speaking for the colonists. While Travis was a vocal leader in the movement to secede, he did not stand up for the colonist’s rights, but he did earn a good living representing slaveowners who wanted their property back. Davy Crockett deserved a better portrayal. Hunnicutt does not really channel Crockett, he just makes a lot of stupid comments. The writer even screws up Crockett’s goodbye speech, saying that his constituents had told him to go to hell or go to Texas, so he took Texas. Learning that he had failed to win re-election to Congress, the real man had told his constituents that they could go to hell, and he would go to Texas. Seriously, how do you screw that up? 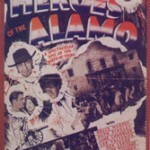 While the real Crockett had arrived at the Alamo as part of a group of thirty volunteers, he was not in charge, and had come in the hopes that a brief period of military service would increase his chances of gaining a position in the new government when Texas officially seceded. Aside from the major problems, there is a minor quibble. The Mexicans politely show up in the sunny morning with scaling ladders and wait while the defenders nobly say their goodbyes. While I appreciate polite people, it seems unlikely that the scaling ladders for the final assault were carried by horsemen, since the actual attack was done before dawn. Don’t worry, there is a romance. Consuela (Anna Maria Alberghetti), the niece of a Mexican leader in the revolution, has a major crush on Bowie, who has recently become a widower. Bowie’s wife had even left him a letter telling him to find another woman, and Consuela is just like her, only younger, which is never a bad thing. Bowie’s wife had died of cholera, but the relationship with Consuela is completely made-up. The letter telling him to find another woman is a nice touch though, have not seen that in a movie before. 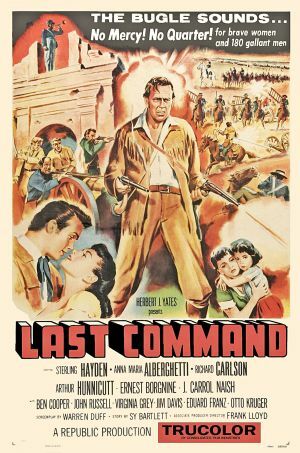 John Wayne had originally wanted to make a movie about The Alamo for Republic, but studio head Herbert Yates refused to let Wayne direct as well as star, so Wayne left the company when his contract ended in 1952. He would make a big-budget version in 1960. It is so lame, even for the time. Admittedly, it is more accurate than John Wayne’s version but it is also much less fun.